We all know that no one lives forever, but there are some people who have passed away that have left us in shock. Elvis: Do you remember where you were when you heard he died? I was at band camp, walking across the field when we were told the news. We were just shocked beyond belief. He was bigger than life...it seemed he would be with us forever. Lady Diana: I remember when news broke about the car accident, I just knew she would be taken to the hospital and eventually be okay. She had so much more to give to the world; it was such a tragedy. And now, Pat Summitt. If you know anything about women's basketball, you know about Pat. She was diagnosed with early onset dementia/Alzheimers 5 years ago, but somehow we thought she'd be around for a long time. She IS women's basketball. 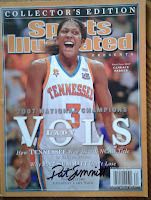 She began coaching at the University of Tennessee (THE UT, for you Texas people!) right after she graduated from UT-Martin at the age of 22. She did it all: coach, drive the bus, wash the uniforms. She fought for women's basketball to be noticed, and she did it well. Every single one of her 4 year players graduated. Every.Single.One. She was known for sitting in class (or having one of her coaches do it) with her students when they were having trouble. She required her players to sit in the front row. If any of her players...even the "star" players"...didn't follow her rules, they sat on the bench or didn't travel to away games. She didn't play around. She cared about those young women as people, not just players. And that stare. Oh...My. I remember telling my mom that I would have done anything she wanted me to just to not have that stare directed at me. I always felt so sorry for those players who were on the receiving end. I didn't know her personally; I never had the opportunity to meet her, but, like everyone else in the Knoxville area, I felt like I did. 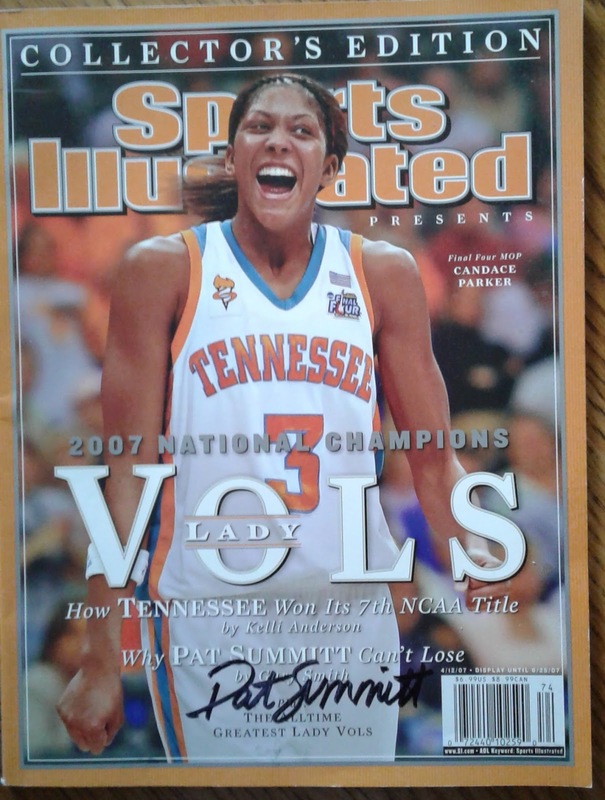 I didn't play basketball past my junior high years, but I don't know of very many young girls who dreamed of playing for Pat & the Lady Vols. Not just around East Tennessee, but all over the U.S.; even Gino Auriemma's (coach for UConn) daughter wanted to play for her! Not everyone may have cared for her, but I don't think you'll find one person who didn't respect her: Strong-willed, determined, ethical, and still being full of heart and concern for those in her life. She will be deeply missed. Women's basketball won't be the same without her. The University of Tennessee won't be the same without her. Please keep her son, Tyler, in your prayers. This is the only thing I have with Pat's autograph. I almost threw it out a few months ago...I'm glad I didn't! I'm not a basketball fan, but even I know who she was. I learned by watching the news this morning that she had a 100% graduation rate. That speaks volumes in this day and age. 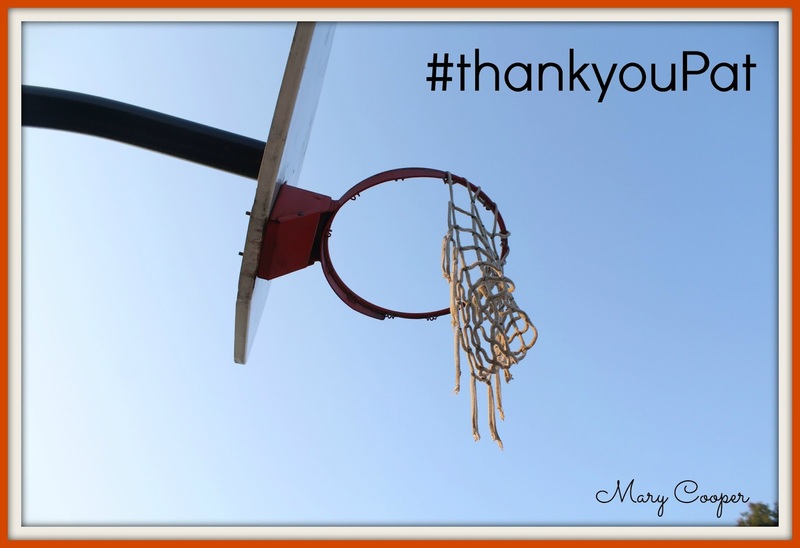 Mary, You have written a beautiful statement of Coach Summitt's legend and career at the University of Tennessee. Those of us who have grown up in the Knoxville area, whether we ever met her or not...knew her. She WAS Tennessee and we respected her, loved her, and was so very proud of what she did for our community. RIP Coach...you will be missed. Mary, you have expressed your thoughts on Coach Summitt's legend and career at the University of Tennessee so eloquently. There are so many of us who grew up in the Knoxville area who are feeling the same emotions as you today. Whether we ever met her or not...we knew her...and respected her, loved her, and are so very proud of her accomplishments and contributions to this community. Prayers and peace to family and friends. I've never been a basketball fan, but do remember how sad it was when news of her diagnosis got out. So sad and such a loss. She left a great legacy behind. I'm not a sports person and have to admit that I don't know that I've ever heard of her. I am sorry for her loss and the loss for your community. I have, however, heard of Elvis. And while I do not remember where I was when I heard that he had died, I do remember that it was two days before my 12th birthday. One of my older cousins and I had planned to go visit him when she turned 16 and could drive. I was devastated! It had to have gone down as the worst, most depressing birthday in history because he died. My daddy went out and got me a zillion Elvis albums. I played them as often as I could. It was Elvis (and another cousin) that got David and I back together after we broke up for awhile. His song "Are You Lonesome Tonight?" was the winning song. Elvis was also my cousin. Very shortly after Elvis's death and my birthday, we got word that my aunt and uncle had been found murdered in Mississippi. August 1997 was an extremely traumatic month. I don't remember what I was doing when we got the word about Princess Diana, but I do remember watching the funeral service and being so sad for her babies and so mad at Charles. I remember the Challenger explosion like it was yesterday. I was in our living room, straightening, listening to the news, and there it was. The explosion clear as day on my screen and I freaked. I mean, those people just got blown out of the sky! I was pregnant, home alone, and crying my eyes out. I called David to let him know what had happened and I don't remember anything else beyond that. Losing a good teacher, one that has meant so much to one's life, or the life of a community is a hard thing to process. I have been there. You just can't imagine how things will ever be normal again without them there to guide and teach. Rarely are they replaced with someone as great as they were. It can be hard to give the new person a chance because you still want the one that has been lost. Your community is in my prayers. Sorry if this was too long. Have a blessed week. My Favorite Coach Summitt story was from my freshman year at UT Band Camp. In those days the band practiced in the center of Tom Black Track, and she was always there in the AMs walking. One morning we were having an awful rehearsal... next thing you know she is on the drum major ladder yelling, "Get over here!" We all stood for a few seconds, trying to comprehend that Pat Summitt was yelling at us. Heck yeah the whole band got over there! She chewed us up one side and down the other... but the thing about it was, she was exactly right. And she gave us back a sense of pride that was awesome. The rest of rehearsal was very productive. I'm not a basketball fan, but I am a UT fan, and I admire Pat Summitt for all she has done, and all that her legacy will continue to do. Gotta admire someone who talked the talk AND walked the walk. She made women's basketball fun to watch. ALZ is so cruel.